The baitcasting reel dates back to the mid-17th century. Early baitcasting reels were made of iron or brass gears, with spools and casings made of silver, brass, and even hard rubber. Many anglers before you have been using and perfecting this reel to catch some of the biggest fish out there!. Why choose a baitcaster over another reel? Being right or left-handed is just as important as where you plan to fish. Are you just learning the art of angling or are you more experienced? These and other important questions are critical before buying the best baitcasting reel for yourself. When going through baitcasting reel reviews and trying to figure out which is the right reel, you will come across many options. Most depend on how/where you will be using it along with personal preferences. Our buying guide will shed light on your quest! 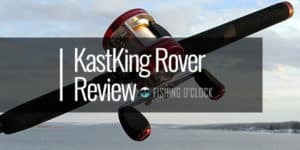 We selected models worth considering for saltwater and freshwater fishing, and we will also mention some affordable units for those on a tight budget, especially under 100$! The reel is suitable for both salt and freshwater, which speaks about its versatility. When it comes to features, the first thing that you notice is the 8.5:1 gear ratio, which secures consistent and admirable speed at all times. The retrieve is smooth, and the durability of the gear is further supported with the X-ship technology. The overall lifespan of the unit is also solid thanks to the HAGANE body. The manufacturer claims it is strong enough to participate in tournaments. The anti-reverse feature is reliable, and the bearings are resistant to corrosion. The spool shaft and pinion gear are in an ideal arrangement at all times, which secures a long casting range for the unit. The reel features six braid bearings plus an extra roller one. The size of the handle is a bit small, but if it doesn’t fit, you can quickly solve that by replacing it. The preferred material of the manufacturer when designing this reel was aluminum. Thanks to that, the unit is lightweight but sturdy. Apart from the frame, the spool is also aluminum, and it was made in one piece for added durability. The primary and pinion gear are of stainless steel, and the unit features a total of six braid bearings. 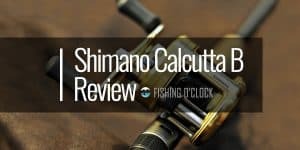 The gear ratio is 4.3:1, which might make the reel a bit slower compared to some other units, but that shouldn’t be a problem when you get used to it. The drag system is reliable, and the handle feels quite comfortable. The reel is quite versatile, and you can use it for different species of fish. You may need to make some adjustments if you want to catch large and heavy fish, but the important thing is that the control of the unit is optimal. 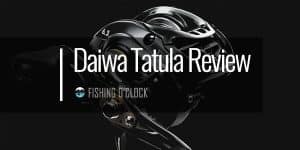 These reels are among the biggest that Daiwa produces, and they have some impressive statistics on paper. For starters, they have an 8.1:1 gear ratio, which secures admirable speed. The 7-bearing system with six standard ball bearings enables smooth cranking. The handle is of optimal length, and it should feel comfortable. The drag system has a maximum of 132 pounds. That makes the unit suitable for pros and tournament anglers, too. Aluminum was the material of choice for the frame and gear side, which makes the unit quite durable. After all, the HD in the name stands for heavy-duty, and that implies the reel is suitable for extreme weather conditions. If you a fan of long distance casts, you may need to find an optimal position of the guide. It may take a bit of your time, but it will enable you to reach a longer range. The Swedish manufacturer made a unit that looks attractive with the combination of the red and black matte finish. The overall feeling is that the reel is light but durable. The choice of materials makes it suitable for saltwater fishing. The product offers a smooth fishing experience thanks to the generous and durable bearing system. 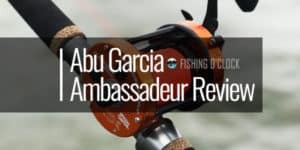 A total of eleven bearings, including ten ball bearings made of stainless steel, are in line with what even the veterans might expect from a reel. Mono capacity is 145/12 yards/pounds while braid capacity is 140/30 yards/pounds. As for the gear ration, it is set at 10.1:1, which secures the high speed of the reel. If you care about not losing a single second when you fish, you should consider this unit. Keep in mind that the company offers right and left-handed models, but make sure to pick the right one. As long as you choose a suitable option, the handle should be comfortable. If you need durability, you should look for stainless steel. They seem to be aware of that in Okuma, which is why their reel uses that as the preferred material. The main and pinion gear are of stainless steel while aluminum was used for the spool, frame, and side plates. The coating is resistant to corrosion. The bearings are of standard strength and enable smooth cranking. The anti-reverse feature is dual, which allows easy control and great versatility. The star drag system has a maximum drag pressure of 25-30 pounds. The level wind system reduces the potential for line tangling, which can save you time during fishing adventures. The paddle handle seems like a smart choice as it makes controlling the reel a piece of cake, but you can also choose a power handle if you feel it is a better option. 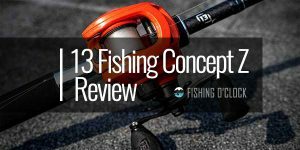 13 Fishing presents a reel with an unusual color combination. The red color is dominating while the handle is black, which are two colors that complement nicely. The product features a paddle handle, and you may need some getting used to it if you haven’t used one before. Another unique thing about this model is that t doesn’t use a bearing at all. Instead, it relies on polymer technology. The company claims that makes the unit easier to control and quiet. 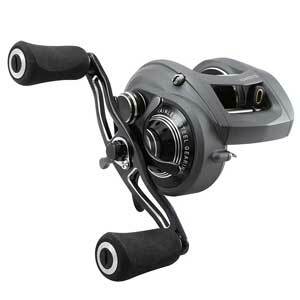 The reel utilizes a bulldog drag with a Japanese Hamai Cut gearing and a maximum drag of 22 pounds. The anti-reverse feature is also a part of the product, as well as a line guide system. When it comes to casting range, it is solid, but the reel can’t cast as far away as some other units. The handle is not interchangeable, which means you should pick carefully depending on which hand is your dominant one. Shimano’s reel is for those who want to maximize their fishing experience while minimizing their effort. The unit has many features that make its use easier, which makes the product suitable for newbies. The HAGANE body is something that this manufacturer is known for, and metal as the preferred material makes a fairly durable reel. The unit tries to enable you to use as little strength as possible for moving it. The retrieve is smooth due to the gearing system’s efficiency. Multiple contact points between pinion and drive gear enable this smoothness. The brake dial is intelligent and has four different settings. Thanks to that, you can adjust the reel depending on the fish you plan to catch. As with any reel, backlashes may happen now and then, but as you learn to command the unit properly, you shouldn’t have a lot of problems with them. The product features a classic design we often see in reels made by this manufacturer. The aesthetics seem like an excellent choice for those who appreciate traditional-looking reels that do not stand out from the rod too much. Graphite is the material of choice for the frame and side plates. The unit is relatively lightweight, but also durable. The drag system seems to perform optimally, and there should be no hesitation. The reel features the two-speed system, which is one of the best things about it, but also a downside. The fact that you can easily switch between low and high gear means a lot, but it can sometimes happen that the product falls out of gear when switching. Fortunately, this happens rarely and shouldn’t affect your overall experience. The high speed ensures a 2.9:1 ratio and the product features a total of four bearings (3 ball bearings + 1 roller). 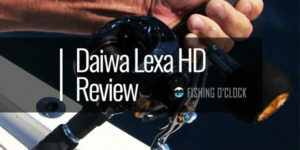 When you see a product made by Daiwa, you can already sense it will be a durable item. We confirmed this when we saw that this reel has an aluminum frame and gear side. The feeling is that the unit is lightweight, but it is also fairly strong. While it may not catch the largest fish out there, it is quite versatile. The quality of the drag system is one of its strongest features. The company claims you can participate in competitions with the drag of up to 13.2 pounds and no hesitation. The handle is comfortable, but it is a paddle-type one. If you haven’t used it before, you may need one or two fishing trips to get used to it. As for the downsides, it doesn’t sound like the quietest reel out there, but that is hardly a deal-breaker. You can always try to reduce the noise by using additional lube. The reel is round, and the company made it for those who focus on catching catfish. The reel is smooth to use and features a four-bearing system with three ball bearings of stainless steel and an extra roller one. The braking system is centrifugal, which contributes to the optimal precision of the cast. The drag system is reliable, and the level-wind feature prevents line tangling during the retrieve. As for the speed, the gear ratio is somewhere in the category of average with the speed going up to 4.1:1. The obvious downside is that the manufacturer designed only for one type of fish. With some adjustments, it may be suitable for others, too, but you need to have some skill to know how to adjust it properly. Additionally, the power handle is a bit bigger than usual, but that shouldn’t be a problem for most users. A compact-sized reel is suitable for beginners, but also veterans who prefer focusing on fish species that are not so large. The line capacity is 120/12 yards/pounds, which is enough for average casting lengths. It is interesting to note the unit weighs less than seven ounces, which makes it exceptionally light. The gear ratio is set at 5.6:1 and the product has a total of ten bearings. Nine of them are ball types, and the remaining one is a roller. The most intriguing feature of the Lew’s product is the dual-setting brake system. It combines the centrifugal system with a magnetic cast control for optimal experience when using the reel. The handle is not interchangeable, and it can only be suitable for one hand, so make sure to pick the right model. Additionally, you may feel the handle is narrow when using the reel in dropped position, but you will learn to maneuver it with time. A golden reel like this one can be an excellent addition to a black or other dark single-color rod. The aesthetics are a matter of personal preference, but what is important is that this is a round reel. The baitcasting product has an aluminum body and is quite durable. You can use the product for a long time as long as you steer clear of saltwater fishing as that can affect the unit’s durability. You can prolong its longevity by washing, but for optimal lifespan, stick to freshwater fishing. The unit features three ball bearings and has a maximum drag of up to 16.5 pounds. The bearings are of solid quality and resistant to corrosion. The crank feels smooth and its retrieve per range is up to 28 inches. You can also expect an anti-reverse feature, as well as a variable brake system. For an affordable reel, this unit is quite versatile. You can use it in fresh waters, such as a lake, and even take it on a saltwater fishing trip as long as you fish inshore. Consider it an option if you are only entering the fishing world. It is a low-profile reel equipped with a five-bearing system. The casting and retrieving seem quite smooth. When it comes to distances, most users shouldn’t be pleased, although it cannot reach the range of some more expensive units. The manufacturer designed the reel in a way that the spool has optimal balance. The decreased vibration means the unit is easier to control. The reel has both internal and external breaks, which is another point in favor of controlling it effortlessly. The design of the reel is modern with the black color dominating. The gray details fit well, as well as the paddle handle. The first thing that you notice is the impressive speed for a reel that has a budget-friendly price. Even experienced anglers will be glad to know that the unit has a 7:1 gear ratio. The reel uses an 11-bearing system with a generous number of ten ball bearings and an additional roller one. The ball bearings are shielded and resistant to corrosion. As a result, they are durable and enable long-distance casts. 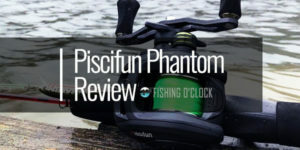 Since it is an affordable reel, keep in mind you might face a backlash now and then, but it is still a good deal for the money. The brake system is dual and combines an internal frictional and external magnetic brake. The beginners will appreciate that level of control. The drag system has a maximum set at 17.5 pounds, which is also more than enough if you keep in mind that this unit is affordable. A modern reel that looks cool and can be a great addition to any rod. It will look especially nice if you like the combination of black and red. As for the performance, the manufacturer insists that its main gear is larger and stronger than in similar units, which makes this bait caster reliable. They used the Japanese Hamai Cut technique to ensure it is a dead stopper, and contribute to the unit’s longevity. The graphite composite body might not be suitable for saltwater fishing, but it will serve you well for all freshwater experiences. The gear ratio is 7.1:1, which implies the speed is quite admirable. The maximum drag is 18 pounds, and the unit has three drag washers of carbon fiber. The reel also features a magnetic brake and double shafts for line winding. Some components may not be as durable, but replacing the parts will be a simple process even for beginners. As usual with affordable reels, graphite was the material of choice when designing this bait caster. We were a bit surprised with the ball bearings of stainless steel. There are four of them, and the additional roller one ensures a smooth retrieve. When you take the reel in your hands, you notice that it is lightweight. That has both good and bad sides. As a light reel, it is suitable as an entry-level reel and easy to control. However, it may not be adequate for catching large fish, but keep in mind this is a low-budget unit, and you can’t expect wonders from it. The handle is compact bent, and the reel foot is recessed to ensure that the grip is optimal. The drag performance is smooth, and there seems to be no hesitation. The drag has a maximum set at 18 pounds. The round bait caster is suitable for both fresh and saltwater due to the full metal body. The spool and side plates are made of durable aluminum, and the product even has some parts of stainless steel. The T-handle is an interesting feature. The manufacturer made it over-sized on purpose to ensure that you have no issues with slipping. The carbon fiber drag has a range of up to 20 pounds to ensure that the reel meets the expectations of even the demanding users. The product has multiple ball bearings and centrifugal brakes which are quite reliable. The unit is quite versatile, and you can use it for casting and dropping the line. However, it seems to be more suitable for the latter as cast distance could be better. You can, however, catch big and small fish with this reel, including carp, catfish, and others. With under six ounces of weight, this is one of the lightest reels on our list. That doesn’t compromise its performance or durability. You will get solid value for the money and a product with an expected lifespan for the price. The 7.0:1 gear ratio implies a high-speed reel and enables you to enjoy long-distance casting. Six ball bearings of stainless steel are resistant to rust, and the clutch bearing is shielded for extra durability. The combination of magnetic and centrifugal brake proved to be the optimal solution for everyone seeking effortless control of a reel. The product features a metal paddle handle that is comfortable, but it is an overall impression that it could be of better quality. It may bend after you use it for a while, but the good news is that it is easy to replace it. This high-quality reel features an enhanced centrifugal brake system which minimizes the worry about backlashes while retrieving the cast. The brake system is easily accessed through an open side-plate that allows for on the fly quick adjustments. The Spartacus reel’s main components and the shaft are made of stainless steel while the frame and body from aluminum alloy which really creates a reel with durability, rigidity and optimal performance. It’s critical for corrosion resistance and easy maintenance of the reel for years to come. The stainless steel bearing systems give you smooth and accurate long-range casting and it is also coupled with a one- way instant anti-reverse system that provides added control for drag. This reel’s spool is designed with machined aluminum for a smooth spin to fly baits further while reducing its overall weight. So, the assumption is that you have a bit of experience now with angling and you are thinking about how you can up the ante and start complimenting your existing skill set with some additional diversity regarding the type of fish you can catch. The simple explanation of what a baitcaster is that it’s a reel that has a revolving spool and sits on top of a casting rod with a trigger handle. This contrasts with a spinning or spincast reel which sits underneath a spinning rod and with the line guides facing down. Only pay attention to Baitcaster reels where the manufacturer uses either high-grade aluminum or graphite. Graphite, which is a lighter material than frequently used metals such as aluminum, isn’t as strong nor can it provide as much raw, brute strength as other more well-suited metals can. Gear ratio refers to the speed of the reel. Usually, gear ratios in Baitcast reels are 5.4:1 going up to the range of 7.1:1 – which indicates how many turns the spool makes for each rotation of the handle. 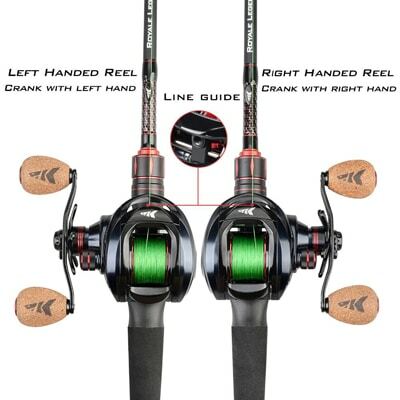 Just to clarify, a reel with a designation of 5.4:1 it means it performs 5.1 revolutions with a turn of the handle. Braking systems are a critical part of baitcast reels. Brakes, similar to the idea with cars, adjusting the spool’s rotation and works to slow it down. Without a braking system, the backlash would be happening a lot more during normal operation. As a refresher, a backlash is the knotted mess you are left with when your spool keeps on revolving after your lure has stopped moving forward. Baitcaster reels use a braking system to help manage the speed of the spool when casting. the brakes are there to reduce the amount of backlash that occurs on the reel’s spool. Centrifugal brake systems include two to six pins which allow you to activate and deactivate the breaks. Magnetic braking systems which are based on, you guessed it, a set of magnets that react to non-magnetic metals ( such as aluminum ) incorporated in the spool. The logic behind this braking system is that when you move the magnets towards the spool it activates the breaks. Meanwhile, moving the magnets further away from the spool allows the spool to move without restraint. Braking systems are critical to any Baitcaster reel but learning to properly thumb the spool is equally important when it comes to controlling spool speed. This skill will take time as all baitcaster anglers have learned before you. Pick a bigger (deeper) spool because the larger spool reduces the size of the line coils which makes management of the line less complicated. Perfect when using heavy -duty lines. Smaller shallow spools are great when used primarily for catching fish in covered shallow water. Baitcaster reels have variously sized handles. Some of which have shorter than others. Which is okay for most situations like handling worms or jigs. You may reconsider if you are going to use larger crankbaits or swimbaits. Bigger and longer handles generate more torque enabling you to pry fish out easily. Pay attention and be on the lookout for bearings that are made from strong materials such as magnesium and aluminum. They are lightweight and long lasting with enhanced suitability for any type of fishing. These strong materials will give you the best performance with a lot of durabilities. High-quality bearings, identified as shielded, double shielded, or stainless will help support the gears and keep the reel running smoothly while enhancing performance. Drag is the tension that is directed to the spool dictating how easy it is for the line to be pulled off of the spool. Look for a drag system that has “low start-up inertia” which means the drag is employed evenly and smoothly. 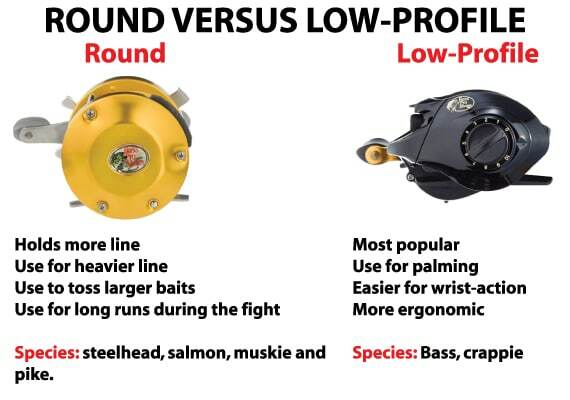 Low profile and round Baitcaster reels are very similar but the main difference is the size. Low profile means that the reel is a smaller and lighter reel whereas a reel that is heavier and larger is labeled as a round one. Low profile is much smaller and lighter so it’s a preference for a lot of anglers due to low fatigue and easy on the wrist operation. A round baitcaster reel could be as much as 50% larger than a low one. This is where the round profile wins out single handily. It can hold a much larger weight and the actual amount of line so that if the fish makes a run for it, you know you have more than enough to compensate. Low profile holds their own for their size but doesn’t have a good drag as the round baitcaster. The Round profile can handle much larger fish and provides for a much higher rated drag system. The low profile usually is for medium sized fish ( 0-14lbs ) and the round profile is typically for much larger fish ( 12lbs+ ). When you thought, you had it all figured out about Baitcasters and THEN you are asked if you need a left hand or right handed reel? Come again?. Baitcaster reels traditionally have the location of their handle on the right side. That means a right-handed caster will make a cast and then switch the rod to the left hand so the reel can be cranked with the right hand. Does that sound efficient?, Most agree with you that offhand it doesn’t, but experienced Baitcaster anglers will tell you that it’s quick and simple once you get familiar with it. Typically, right-handed fisherman will use a spinning reel that has the handle on the left so that when casting and holding the rod with their right hand they are reeling with their left. There doesn’t seem to be a large reason why this became the de-facto standard besides most anglers do it and it seems to work well. Some anglers find more control with switching hands and since they are strongest dexterity wise with their right hand, its preferred. However, there is a good argument for a reel in the lefthanded position as it does have many advantages over a handle on the right side. For example, you are not switching hands when you cast the line thus, fewer backlashes. This also allows you to work top-water baits better as the moment the bait hits the water you can start reeling without switching hands. Left or Right: What’s Baitcaster do I Need? So, the question on your mind is probably what handed reel is best for me? That really comes down to what you have got used to when you first started angling and what feels more natural to you. Most anglers will tell you that it’s not the most fluid and easy things to do, switching casting methods from left to right or right to left after you become experienced with either one. Let’s take a look at a few of the attributes of a baitcaster reel and how they differ from a spinning reel. A Baitcaster combo (rod and reel), without effort, provide longer more comprehensive casts than other reels include spinners. The difference lays with the amount of control you have with the baitcaster and that the instead of uncoiling like a spinner, the line is unwound straight from the rod. Baitcasters are considered more powerful with enhanced torque and control. Due to the design of the reel and the way the line is centered with the spool, gears and handle it offers a higher level of ruggedness and ability. Baitcasting reel combos are able to offer the angler more control while casting and due to the highly tactile way, one operates the reel- with their thumb. Pressure can be applied and taken off depending on what you want and what your goal is. Check out our choices for the best spinning reels out there. 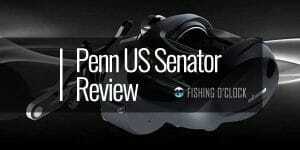 And, be sure to check “differences between baitcaster and spinning reel” full review for further information! If you’re still having a hard time to decide, you should also check out the differences between fishing reel types! For any serious angler out there, eventually, you will be upgrading your reel from a spinning reel to a baitcaster reel. Due to its durability, strength and high level of control, baitcasters win with experienced fishermen. Like most other products, baitcasters come in all sizes and performance levels. Usually, price does indicate the quality level you will get but that’s not a set rule. Also, each brand will produce reels with different features that you may or may not need, depending on your style of fishing and what your goal is. When choosing a Baitcaster in general whether its saltwater fishing or not, you want to make sure certain criteria are checked off to ensure you are getting the best reel and the one designed for what you intend to do with it. 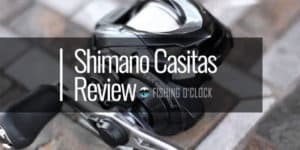 Let’s take a quick look with a bit of recap on a few of the main things to look out for in the best baitcasting reel for saltwater. Look for an aluminum frame- they are the strongest and will last the longest compared to a graphite mixed one. High-quality frames are coated with an anti-corrosive layer that protects against saltwater damage and general wear and tear from the elements. Anti-corrosive protection appears to be the most critical aspect for saltwater fishing as it protects your investment and also maintains strength and durability so that you can fish with confidence. A Baitcasting reel with a good breaking system is directly related to easy casting when you fish. Making sure the braking system is well designed will make catching the big saltwater fish that much easier. 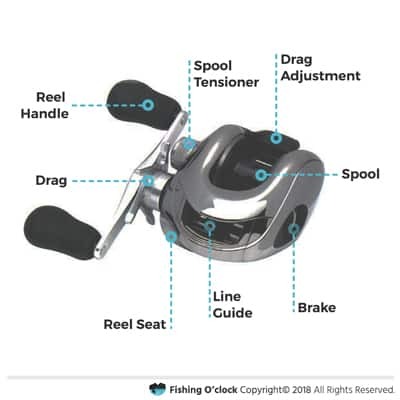 The connection between how many times the spool turns after one turn of the handle is known as the gear ratio. A high gear ratio means a faster spool. You will want a Baitcasting reel with a higher gear ratio if you desire a faster retrieve and to avoid fatigue. 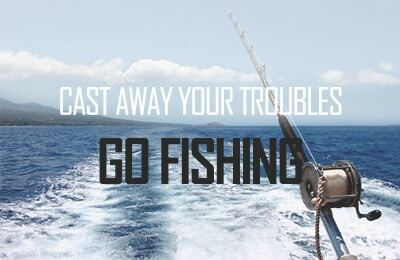 For saltwater fishing, make sure they are protected from the elements. For large fish, a larger spool is needed so that heavy lines can be accommodated comfortably with the spool. When Buying a Saltwater Baitcaster, What Factors Should You Consider? Potential saltwater reel buyers should be on the lookout for some specific qualities in a saltwater reel. Due to the inherent differences between freshwater and saltwater sources, there are specific qualities a baitcaster designed for saltwater sources should have. Achieving distance in your casts is critical when fishing in saltwater because there is a lot of open waters you need to cover. Due to the design of the baitcaster reel, it will always beat the spinning when it comes to getting some distance between you and the bait. Baitcasters are designed to make the line roll directly off the spool in the direction the spool is spinning. Which is in contrast with a spinning reel, where the line slides off the non-moving spool which results in more friction. Having a reel that is durable and strong is important in saltwater situations. This factor really does set the baitcaster reel apart and makes it superior to the spinning reel in terms of strength. Fish living in saltwater are usually a lot bigger than what you can find in freshwater, emphasizing how important it is for the reel to be high performance when exposed to a lot of force. A baitcaster reel with a high-quality drag comes into play here as well. An anti-corrosive coating is critical to saltwater fishing. The salt will destroy the reel and rod if the different parts of the system are not protected and designed to withstand the elements. After you are experienced with the mastery that is required from a baitcaster, you can cast your bait with greater accuracy than with a spinning reel. This is one of the great qualities of a baitcaster, where you can adjust the speed and distance of your bait using your thumb. Precision matters because it gives you complete control of how much line is coming off. Baitcasters are the preferred choice for seasoned anglers who have a taste for the precision and brute strength that the reel provides them. With all things in life, there are benefits and drawbacks. Let’s take a quick look at what’s important to know about the famous baitcaster. Heavy lines are critical fishing larger game fish. Once you gain mastery over the baitcaster’s learning curve, the line control possible by placing the thumb on the spooled line allows for enhanced levels of accuracy and placement that you don’t find in spinning reels. Spinning reels have a more susceptibility to line twist that can affect the performance and casting of the line. Line twist is not an issue with baitcaster reels. The line spools directly onto and off the spool of the reel, which also may help prolong the longevity and usefulness of the lines. Baitcasters are typically more expensive than regular spinning reels- you have to pay for the enhanced performance and precision. Although, you can find decent reels for under $100. Baitcasters are not for newbies or people that are just starting in the world of angling. They require a lot of patience, work and practice to master the subtle movements required to cast the perfect line and not to make a mess of things. Backlash, which is when you fail to control the line and it turns into a big tangled mess, happens when you have not learned how to control the Baitcasters subtle mechanics. Ask any angler out there, A backlash is dreaded and you do NOT want to have to deal with untangling the mess created by it. Baitcasting is a very manual fishing experience unlike the simple operation style of a spinning reel. Q: Are there reels better for saltwater fishing? A: Yes! 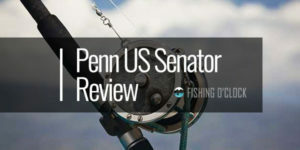 saltwater fishing requires additional protection for the reel and other components to make sure they last the brutal conditions of the open seas. 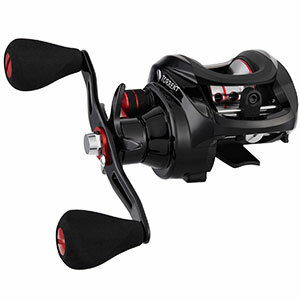 Q: What do I need to know about the differences between reels made for freshwater and saltwater? A: Well, for starters, salt is deadly to all metals. Which makes sense as to why fishing reels designed for saltwater are made with stainless, non-corrosive steel to the metal, that is the reason why saltwater reels are made from stainless steel and other non-corroding components. You cannot escape it buy you can resist it!. When in contact with saltwater, reels that are designed for only freshwater sources will corrode and most likely get damaged. One solution to that is rinsing your reel after its use. Make sure you get a reel that Is designed for the saltwater. Q: Ok, so I am looking to get into using a baitcaster reel, what should I look out for? A: There are a few main characteristics that you should pay attention to when buying a baitcaster reel. The Frame: Look for an aluminum frame- they are the strongest and will last the longest compared to a graphite mixed one. High-quality frames are coated with an anti-corrosive layer that protects against saltwater damage and general wear and tear from the elements. The Brakes: A baitcasting reel with a good breaking system is directly related to easy casting when you fish. Gears and Speed: The connection between how many times the spool turns after one turn of the handle is known as the gear ratio. A high gear ratio means a faster spool. Physical Size Of The Spool: For large fish, which typically baitcasters are designed for to catch, you will have to buy a larger spool size so that heavy lines can be accommodated comfortably on the spool. Q: What are some pros and cons with using a baitcaster reel? A: Good question. Baitcasters are known for their durability, superior casting, and precision when it comes to catching the big fish out there. What you do make concessions for are to do with price ( they are more expensive than spinners ) and they do have a much longer learning curve than other reels out there. Q: Ok, I am getting a baitcaster reel. Do I need a right or left handed one? A: That usually depends on preference and what you feel lets you cast and retrieve the most efficiently. See the explanation above as to the reasons why some choose one or the other. Both have their benefits based on what the anglers are used to and what they feel works best. 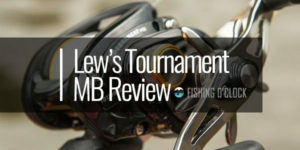 Read on for the definitive fishing reel buying guide from our editors! When you’re done, read our spincast reel buying guide and fly reel reviews round-up here! All anglers with a few fishing trips under their belt will confirm, choosing the best baitcasting reel for yourself can be a bit overwhelming! You need intermediate level knowledge and experience to operate these fishing tools. Take time to do the research and make sure the investment you are making is the right one for your specific needs. When you do make the plunge and decide to buy a baitcaster, you need to take into consideration a few variables such as will you be using it in freshwater or saltwater environments? Do you need a right-handed or left-handed reel and what type fish are you going to be targeting while angling? Going through baitcasting reel reviews will help determine which equipment is best for you and what things you need to look for when choosing to invest in a baitcaster.